Info "What's behind the door?" Open-And-Shut Case is one of Dr. Crygor's microgames in WarioWare: Twisted! The name comes from the term "Open and shut case", which is used to denote solutions that are easy to reach. The game's purpose is to slide the door and open it to see what it hides. If done so, the game is won. 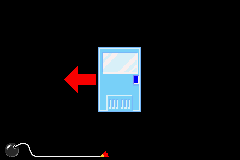 However, if time's up and the hidden scene isn't seen yet or the camera reaches the door and it's not open yet, the player will lose the game. 1st level difficulty: There will be one door to open. The doors reveal Little Red Riding Hood meeting a wolf disguised as her grandmother. 2nd level difficulty: There will be two doors to open. The doors reveal a wrestler taking down his opponent as a referee counts. 3rd level difficulty: There will be three doors to open. The doors reveal a family at the table. This page was last edited on January 28, 2019, at 20:08.